Lisa Alexander, Quantum Metaphysician and creator of the Alexander Method of Vibrational Sound & Energy Therapy TM shares her secret that she, her clients, and her students use to enhance sleep, dream states, astral travel and out of body experiences. The Sacred Ohm is the frequency of Mother Earth, the sound our planet makes if listening to her revolving from space. Achieve a state of deep relaxation in seconds with the primordial vibrations of "Ohm.” Physically tune your body to the Ohm vibration and enter a state of balanced wholeness ideal for healing and higher consciousness. Helps meditators and yoga practitioners achieve desired states effortlessly. Why the Sacred Ohm? Lisa Alexander is a Oneness Blessing Giver, and instills a deep blessing into these forks. Like all her forks, it is tipped with a crystal to enhance the energy when used. 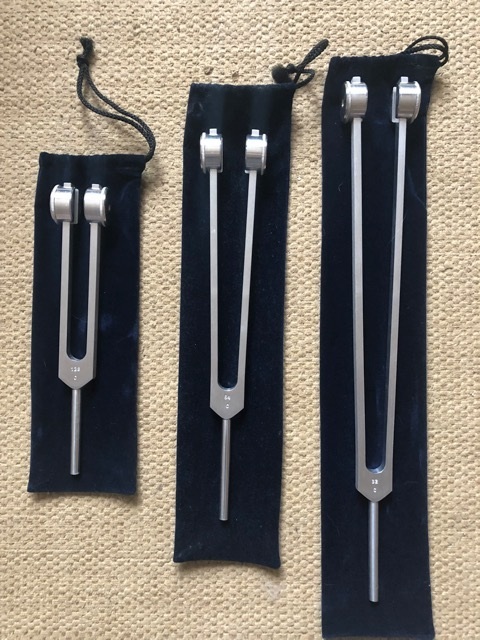 Tuning forks for the Alexander Vibrational Sound & Energy Therapy TM are custom made in the USA for the medical community. They are designed with premium grade aluminum alloy, and with proper care, will last for years! 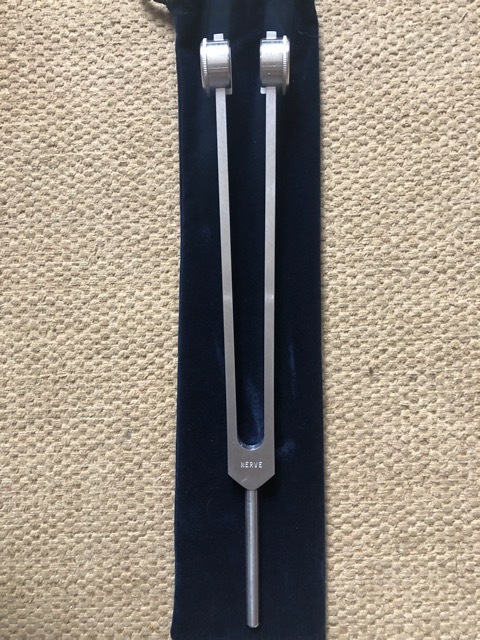 All forks are guaranteed to be tuned within .5% of the frequency stamped on the fork at 20 degrees C.
These forks are specifically designed to be used in the Alexander Method of Vibrational Sound & Energy Therapy TM. They come with colored rubber finger grips and a crystal tip to enhance the energy flow. Also incleded is a velvet case and sounding puck. Based on the ninth octave of the overtone series, The Angel Tuner opens the passageway to the angelic kingdoms. By vibrating your cranial bones, the Angel Tuner opens the gateway for spiritual insights and experiences. This tuner enhances your connection to universal energy for manifesting inspiration and a meditative state, as well as connections with higher powers, visions, and creative expression. Angel forks can also be used for clearing anything; A room, your other forks, crystals, treatment table etc. They clear space and bring in Angelic Light without the smoke of Sage. This makes them a great travel companion and easy to use. Just place 2 forks in one hand and use the crystal tuner, the 4096, in the other hand as your striker fork. Sound the forks and spread the sound and vibration over what you are trying to clear. "Otto" refers to osteo which refers to bones. However the Otto tuning fork set can work on much more than bone. Their frequencies are 32 hz, 64 hz and 128 hz, different octaves of the middle "C" note in the Pythagorean Scale. They are big weighted forks which emit vibration directly into the bones and rest of body to relax, align and restore health and relaxation bone and surrounding body tissue. Directly used on the body to help align your physical structure, the Otto Tuner resonates the bones, stimulates the nerves and releases tension from the body. Vibrating your body with deep earth tones, the Otto Tuners brings a sense of deep relaxation and soothing peace. It relieves muscle tension, spasms, pain, and improves circulation by relaxing constricting muscle tissue and causing increased blood flow. If used with massage, they help release muscle tension on both the client and the therapist. These are used in The Alexander Method of Vibrational Sound & Body Therapy, sometimes referred to a level 2. For those who don’t want or need the whole Otto Tuning set, the Otto 128 tuner resonates to the Perfect Fifth vibration. This makes it a perfect “everything” fork. It is my go to fork for just about anything on in the physical body. It is known to balance the Autonomic Nervous System, bringing the Parasympathetic and Sympathetic nervous systems back into harmony, alignment and balance with each other. Research demonstrates that the Otto 128, when used correctly, increases nitric oxide in the body which allows for the better and healthier functioning of our physical systems and promotes as well as tissue healing. This is the fork EMS and medical professionals sometimes use to help diagnose broken bones. Weighted forks placed on or near broken bones will vibrate the bones causing pain. Often referred to as the field X-ray, or poor man’s Xray. CONTRAINDICATIONS: DO NOT use the ANY Otto Tuning forks on a broken or fractured bone, this will cause pain and may further the damage. Instead, use the tuning fork on an area near the injured bone to increase nitric oxide to support surrounding tissue healing. We learn more about the myriad of uses for this fork in The Alexander Method™ of Vibrational Sound & Body Therapy. The Nerve Fork is a weighted fork, or sometimes known as Osteophonic or Otto fork. It is 50 Hz, the frequency known to nerves. Pain often comes from the chemicals in our nerve endings. When someone is in pain those, frequencies will escalate to a higher frequency. This fork helps bring the nerves back down into normal their healthy range. I have personally seen great results using this fork on my diabetic clients. It helps stimulate the nerves in their legs and feet, which are often numb due to Diabetic Neuropathy. It helps relive pain and bringing feeling back for them. Like all these forks there is a right way and wrong way to use them. We utilize this fork in a variety of ways in the Alexander Method™ of Vibrational Sound & Body Therapy. A portion of all proceeds from sales goes to support charities that help animals and wildlife. All sales are final. We cannot accept returns on tuning forks.